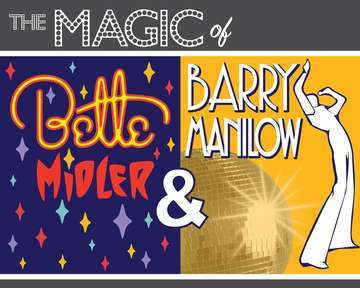 This Bette & Barry duo join forces with their amazingly talented vocals to deliver the Music and Magic of Barry Manilow and Bette Midler. Barry is best known for his catalog of hits that include the chart topping “Mandy,” “Ready to Take A Chance Again,” “Could It be Magic,” “Copacabana,” I Write The Songs,” “Can’t Smile Without You” and many more. This Bette Midler tribute artist has travelled the globe in major productions, “Legends In Concert” and Berlin’s “Stars In Concert” where she is known as the “Best” Bette in the business. Between her beautiful voice, sense of humor and wit, she will take you on a musical journey as she performs “Wind Beneath My Wings”, “The Rose”, “From A Distance”, and “Boogie Woogie Bugle Boy” to name a few. Come and experience THE MAGIC OF MANILOW & MIDLER.